This afternoon at E3, Bandai Namco released the Soul Calibur VI story trailer and finally announced the game's release date - October 19th, 2018. Additionally, they announced a Collector's Edition for PlayStation 4 and Xbox One, featuring a 120 page art book, soundtrack, 12" Sophitia figure, metal case, and more. The SC6 Season Pass was also announced, which contains 3 playable characters and 2 armor packs. More details coming soon! Here's a look at the Soul Calibur VI Collector's Edition and Season Pass. Pre-orders are now live at Bandai Namco's official site. 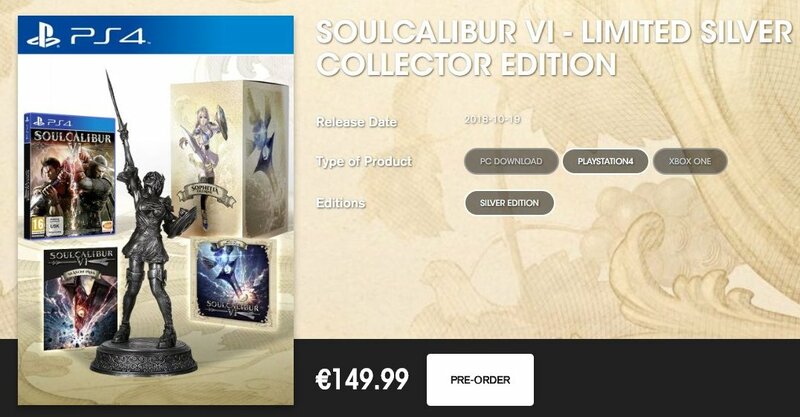 [UPDATE] Bandai Namco's EU store is also offering this Limited Silver Collector Edition.